On Thursday, October 23, we'll be screening Wayne's World as part of our ongoing Suds and Cinema series, which teams some sort of bonkers movie with beer from our robust local craft brewing scene at the Bing Crosby Theater. For Wayne's World, we'll be bringing local lager makers Orlison Brewing, who will have four of their delectable beers on tap in the lobby before and during the film. Beers are just $4, as are tickets to get into the film. We'll be opening the doors and getting beers flowing at 6:30 pm, with the movie rolling at 7:30 after a short introduction from our film history department, of course. Also, we're using this night to also celebrate the Inlander's 21st birthday. That's right, we're finally legal, baby! Check our ID if you want, it's all legit. 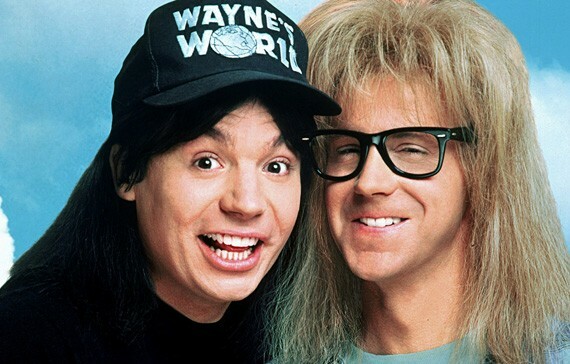 With that in mind, we'll be celebrating with a little help from Brain Freeze Creamery, who are making a special Wayne's World flavor called, appropriately, "Schwing." They'll be serving that surprise flavor up for free before the movie! Also, because we're finally 21, we're keeping the night going with an after party at Rock City Grill immediately after the movie. There, you'll find food and drink specials, including an "Inlander-Red" martini and a yet-to-be-revealed cocktail called "The McGregor" named after the brave founder of our dear paper. A lesson from the Muppets! High school kids in the '90s get a hold of a video camera, a few wigs and their grandma's car. Oh, and remember to get that neck nice and stretched out before you meet us at the Bing.